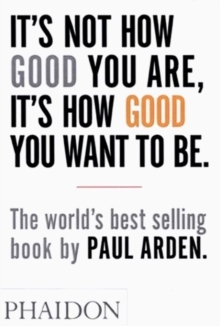 "It's Not How Good You Are, It's How Good You Want to Be" is a handbook of how to succeed in the world - a pocket "bible" for the talented and timid to help make the unthinkable and the impossible possible. Advertising guru Paul Arden offers up his wisdom on issues as diverse as problem solving, responding to a brief, communicating, playing your cards right, making mistakes and creativity, all endeavours that can be applied to aspects of modern life. This book provides an insight into the world of advertising and is a quirky compilation of quotes, facts, pictures, wit and wisdom, packed into easy-to-digest, bite-sized spreads.